8 people flew to Bali and then to Grajagan for the 2017 conference from 7 August 2017 until 14 August 2017. In the late 1970s and early 1980s, stories started to filter in about a mythical left-hand reef on the edge of the jungle in Javanese National Park. In early days, one went overland at night in a small bus, catching the ferry from Bali to Java, then driving down to Plengkung, a fishing village, hearing the morning prayers and catching a boat out through the river mouth, watching out for incoming waves and then being dropped near the camp but still a long way out. 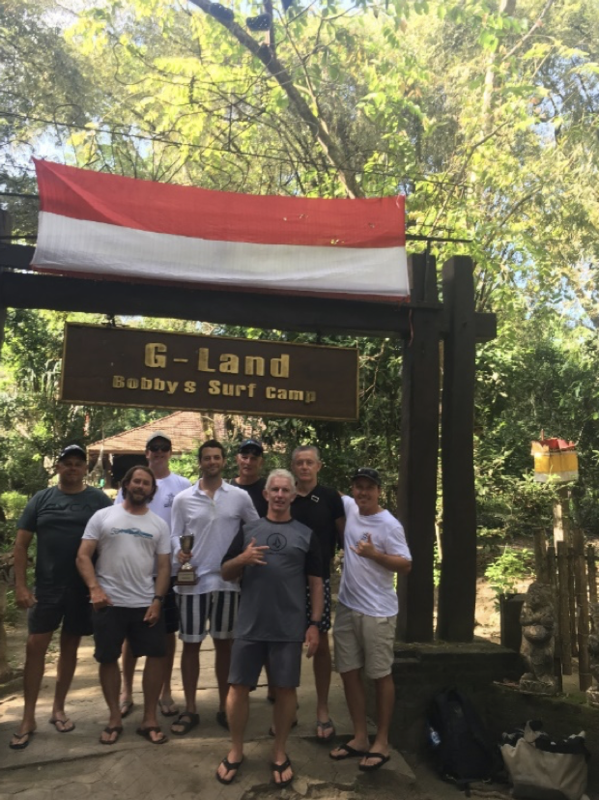 G-Land is on the south-eastern tip of Java on the edge of an 80 km National Park which then had tigers, leopards, panthers, wild boar, deer and big monkeys. The tigers are now extinct but everything else is still there. One stayed in treehouse type sleeping rooms for protection, with the camp on the ground. I first went to Grajagan in 1986 and had a great time. I went there again in 1992 and 2002. There was no question of saying no when the opportunity to go again came up. 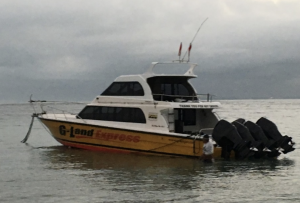 Fast boat access from Bali was even better. An affordable and efficient trip. We flew from Sydney. After a swim, meal and sleep at the Patra Hotel, alongside the airport and on the beach, 8 of us got an early 2-3 hour morning high-speed boat trip right out front on the beach across to G-Land. 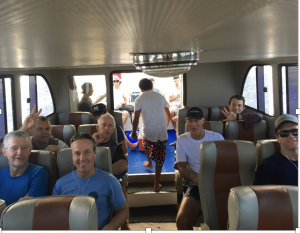 The 8 were Matt Warburton, Murray Hamer, James Walker-Powell (financial planner), Tony McAvoy SC, Paul Mitchell (town planner), Steve Titus, Daniel Aldred (from Singapore – lawyer with ACCOR hotel development), and Chris Buykk (from Perfect Wave, our travel agents). Paul had been there in 1997 and 2000 but the rest were newcomers. Suffice to say we had surf every day from 5 foot up, one day of 14 foot, lots of waves, lots of wipe-outs, good company and a great conference. 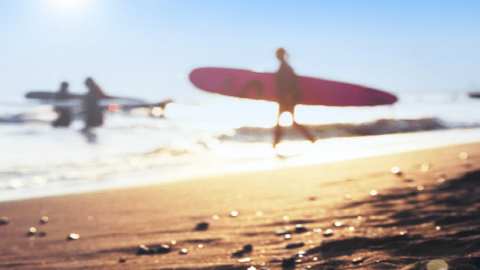 Grajagan is on the destination list for lots of surfers. There were surfers from Brazil, South Africa, Hawaii, USA, Western Australia, Japan and East Coast Australia staying at Bobby’s Surf Camp. The age span was from 16 to 66 with three father and son combinations. There were about 30 in our camp and about 25 in the other camp. The line-up has three main breaks and a couple more down the bay; during our stay it never got crowded. The guys were friendly in and out of the water. It is off the beaten track- nothing like Bali. The original accommodation has been upgraded and is now modern 2 person share rooms, hot and cold showers and toilets and a balcony and good food in the common area. 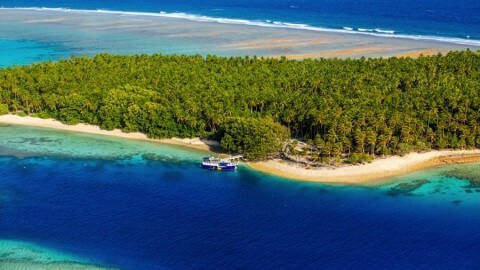 Grajagan is a reef about 700 metres long. The swell hits it at different spots. It is not a perfect wave but is challenging and a wave to treat with respect. 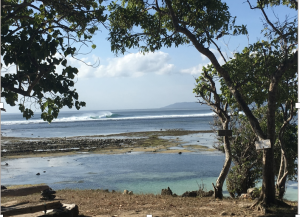 You walk or wade across a reef about 200 metres wide and then utilise a keyhole spot or hope for a lull to paddle out about 100–150 metres to get into the line-up. On the outside far left for about 300 metres is “Kongs”. Waves break all over it. 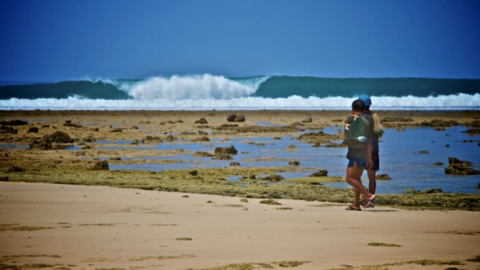 It is a little more forgiving than some of the other sections of the reef and has good to very good waves. To the right of that is “Moneytrees”. Peaks come through over a 200 metre section of the reef, some closing out and you have to be in the right spot to get one. Further right again when the swell is over 8 foot is “Launching Pads”. A big beautiful 20 metre wide peak appears. It leads into “Speedies”, the shallowest and most intense break on the reef. Speedies can also be surfed without Launching Pads working. That section is 100-150 metres long. You tend to do a lot of paddling because a wave can easily go for 100-200 metres. The waves can be great fun and also powerful. It is one of the world’s great waves with mechanical barrelling and walling waves. The lip breaks boards. It is a wave of many aspects and positions. It is not always easy to work out but rewards when you get a good wave. It can also frustrate you for a couple of reasons- the sets can be infrequent, take-offs late and walls fast. 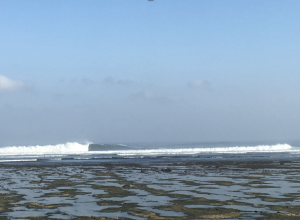 The first day greeted us with 5 foot sets at Kongs. This also meant though that sets that were 2 foot bigger breaking 50 metres further out would come through every 15 minutes and you would have to paddle out to either catch a wave or avoid been cleaned up. It kept you fit and honest and bailing or duck diving. We had good 100-200 metre long waves. Day two had 6 foot waves and we were mainly surfing at Kongs. Whilst paddling wide to avoid getting caught by a big set, Murray Hamer popped out of the tube directly in front of me saying “That was the best tube of my life”. On day two and for my fourth session, I lined up in Moneytrees. An 8 foot wave threw up with a steep take off to have a 15 foot wave face and a wall going forever. An absolute screamer. An 8 foot G-Land express which was the wave of a decade. After 250 metres I tried for a high tube and got swatted, but came up laughing. After that I was smiling every day. Whilst I wanted to get 9 more G-Land expresses, I didn’t get them. The wind, when there was some, was offshore. You had to be right in the spot to catch the wave and you were often paddling hard, even on a bigger board to get a wave. 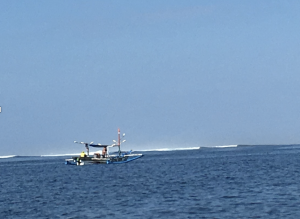 That memo to oneself of “when in Indonesia take one more set of paddles than you would back home”, did not apply. You were often just trying to catch the wave. The take offs were steep and late and we all had wipe-outs. Good ones. The forecast was that Friday would be 8-10 foot. The forecast swell came, only bigger. The bommie was working. It was a beautiful swell and beautiful conditions. Daniel Aldred attempted to paddle out through the key hole to Kongs. We told him he shouldn’t but he went anyway. He was happy not to be able to get out. The waves were massive. 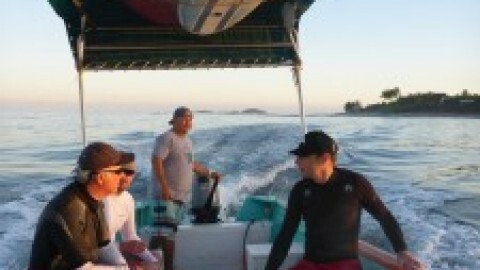 Matt, Paul, Murray and myself got a boat out around the end of the reef and were dropped out a long way out to sea. We were the first ones out. We’re not afraid to say it was scary. 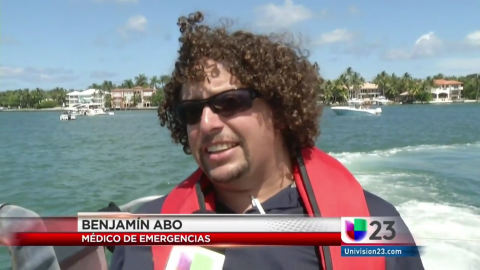 Paul said – “We’re not going to get any waves this far out. Let’s paddle in to catch some waves”. Matt said – “Let’s just wait 5 minutes”. Five minutes later a massive set appeared and we scrambled to get over 3 waves that had 20-foot wave faces on them. We paddled in a bit. I paddled for one and happily missed it. The surf camp guide from the other camp came out and a couple of other guys. We paddled across and watched for 40 minutes some great surfing by guys who knew the place well. 10 foot Speedies with a lip that breaks boards and super-fast. I was surfing for tomorrow. Having seen 7 boards and one body broken 31 years ago, I played safe. Three of us paddled in and Matt Warburton paddled across to get 2 waves and 1 wipeout. I was so happy to be back on land. It was fantastic all day long to watch guys getting incredible waves from the observation deck. That afternoon we went 3 miles down a dirt track in a truck to surf some more friendly waves at Tigertracks and 20/20, two beautiful uncrowded breaks in the jungle. Life in the camp was fun with great company. Many of the other guests in the camp had been there 5-15 times. Rest, take it easy, wait for tide, read, talking about surf spots all round the world with others, massage and exploring the beauty of the area kept you busy. We would sit on the reef edge at sunset having a beer with the other guys. After the evening meal, we often adjourned to play pool and table tennis and tell lies with Tony McAvoy and his iPod and speaker being the DJ with good music. You choose your lunch and dinner choice at breakfast. The staff were friendly and we all fought off the monkeys. The day after the big day was 8 foot. Moneytrees, Launching Pads and Speedies were working. I had a lovely déjà vu feeling in paddling out and seeing Launching Pads work and getting a good wave. 31 years ago, I had 2 days of 8-10 foot surf there and got 10 G-Land expresses. The peak was beautiful. The best guy in the right spot out of the 8 guys on it would get the wave. There were some great tubes, though not by me. I drifted up to Moneytrees and got a couple. Some of the guys would get 5-10 waves in a session. Sometimes less. Sometimes only 1 or 2. Getting that number of 100-200 metres lefts makes you feel alright. My wave count was less. 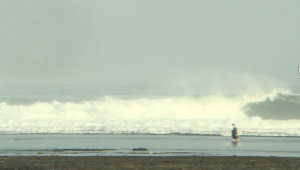 I was trying for Moneytrees waves and was probably in the wrong position or wrong part of the reef and maybe needing a 7’ 6” on top of my 7 foot big wave board. The late Kevin Murray QC said of legal work – “The best is the enemy of the good”. Maybe my tactics were wrong. 5 good ones is probably equal to one great one. I was happy at 64 to get my G-Land express and make it. One evening I gave a talk on discovery and subpoenas generally and their use in a case I had in the Royal National Park Shack Community, at Era and Burning Palms. Tony McAvoy talked of some Aboriginal issues and positive outcomes that they were trying to achieve. Paul Mitchell talked about his experience as an expert witness. 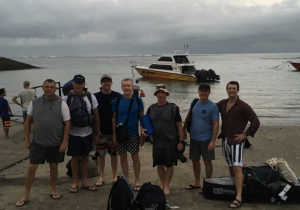 We left on a high note to get the fast boat back to Bali and flew out that night. Perfect Wave and Chris were fantastic. I have been going away with the Surfing Medical Association since 1991. I first went away with ALSA to Sumba in 2010. One of the great things about the conferences, in addition to the great waves and good times you have, is building up a circle of friends and also professional colleagues. The crew I met in Sumba I regularly surf with and they have become lifelong friends. I cross-refer to them in areas with their expertise. Whilst Daniel Aldred received the charging award for his general go for it in the surf and trying to get out on the big day, I think Paul Mitchell, at 66 and often getting 5-10 waves in a session and always chasing more and great to surf with, also deserved an award. Everyone charged. Everyone encouraged and hooted and laughed. No one was injured; it was a great trip all up. An ALSA conference is a lot of fun. G-Land is place that every surfer should go to at least once. If you are a competent surfer who has a go you can have a ball. I’m no guru. Would I go back? Yes. But maybe it’s time for a new wave for the next ALSA conference?